A rising leader with considerable experience in Tibetan areas, including the TAR between 2003 and 2013 (last post was Deputy Party Secretary). Education: A rusticated or “sent-down” youth who worked in Gansu Province in the 1970s. Graduated from Northwest Polytechnical University (Shaanxi Province) in 1982. Career: Worked in Gansu Province 1999 – 2003, rising to Deputy Party Secretary of Lanzhou City, before being transferred to the Tibet Autonomous Region as a Vice Chair of the TAR government, and Deputy Party Secretary from 2006 to 2013. 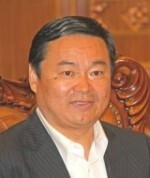 Acting Governor of Qinghai Province since March 2013. Prospects: Hao Peng’s experience in Gansu and the TAR seems likely to stand him in good stead for future promotion. Relevance to Tibet: Head of the government of Qinghai Province, which encompasses large areas of Tibet. Reuters: “We have the ability and confidence to maintain stability in Tibet forever, and we will ultimately achieve long-term order and stability,”… “What you see in the streets, including the police and other legal forces, are necessary measures to maintain stability,” [Speaking about the ban on Dalai Lama portraits] “The Dalai Lama is not merely a religious figure, he is also a mastermind of separatist activities. No sovereign country in the world would allow the hanging of a portrait of a person like that,” he said. Guardian, May 2012: Tibet Daily newspaper said Hao Peng, head of the Communist party’s commission for political and legal affairs in the region, had urged authorities to tighten their grip on the internet and mobile text messaging. “Hao Peng stressed that … the trouble caused by the activities of the Dalai clique has persisted, and the situation for stability maintenance is still complicated and grim,” it reported. BBC, May 2012: [Speaking about twin self-immolations in Lhasa] “They were a continuation of the self-immolations in other Tibetan areas and these acts were all aimed at separating Tibet from China,” Hao Peng, head of the Communist Party’s Commission for Political and Legal Affairs in the Tibet Autonomous Region, was quoted as saying. Address: Qinghai Provincial General Office, No.12 Xidajie, Xining, Qinghai 810000. This entry was posted in Profiles and tagged China, Chinese Communist Party, Governor, Hao Peng, Qinghai, Tibet, Tibet Autonomous Region. Bookmark the permalink.